Last month I wrote about the Journey of Man thematic study, looking at the routes used by our species, Homo sapiens sapiens, as they colonized all the world’s land except Antarctica. 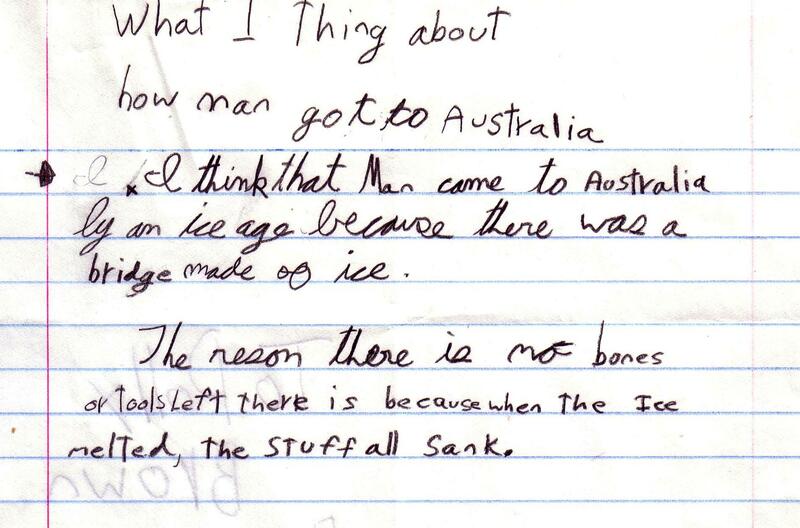 Recently I was thrilled to find a cache of student work samples from the first year of that study. It’s timely. Over the next few weeks, some of the kids from that first Journey of Man class will graduate from college. They’re dancing in their last undergraduate dance concerts; giving senior voice recitals; helping younger students prepare to take over the leadership of campus organizations; getting ready to go off and be teachers themselves. All of you from that class, wherever you are in your journeys, should have that buzzy feeling that says someone is thinking of you, because my mind has been full of the journeys I watched you make, from question to question, draft to draft, project to project. Although I’m in touch with some of you, I’m not sure how to find others. So I’m going to hide names and identify you, if at all, only by first initial. I’m assembling these samples out of the impact of the whole stack, in which I read every word. So in some sense all of you are reflected here. Over the summer before we started this study, I asked students to find and read a book related to the journeys we would be examining: the evolution of hominin species over millions of years; the travels of modern humans colonizing the globe; and the immigrant journeys that populated New England. Students could choose books relating to any of these topics, and I asked them to copy a passage that had been particularly meaningful for them. 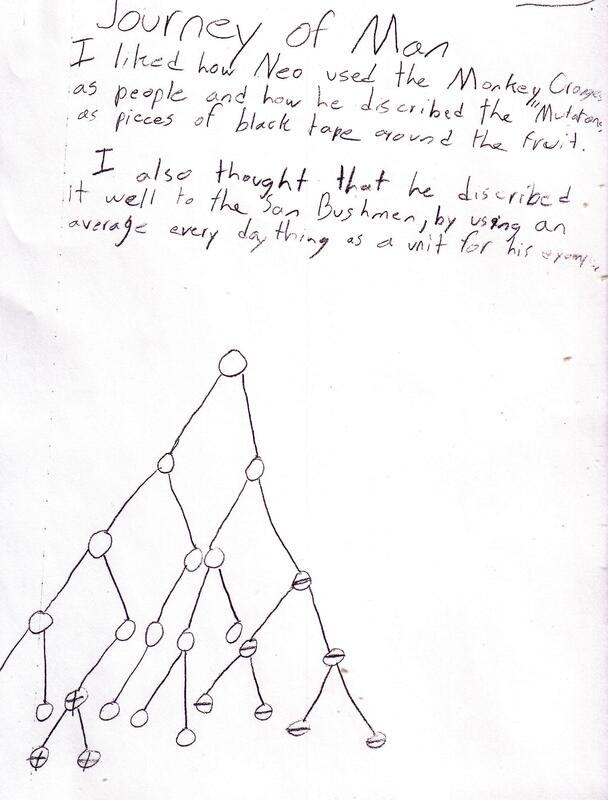 I had offered genetics as a possible book topic, knowing that we’d be doing a side-trip into some learning about genes. 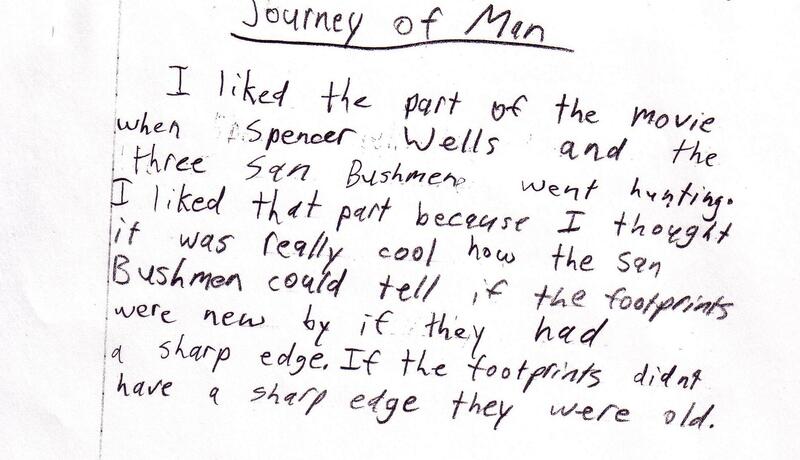 We needed that to help us understand the role of Y chromosome genetics in the book by Spencer Wells from which we had borrowed our thematic study’s name, The Journey of Man. One student read Why Are People Different? from Usborne Publishing, and copied a fascinating passage. 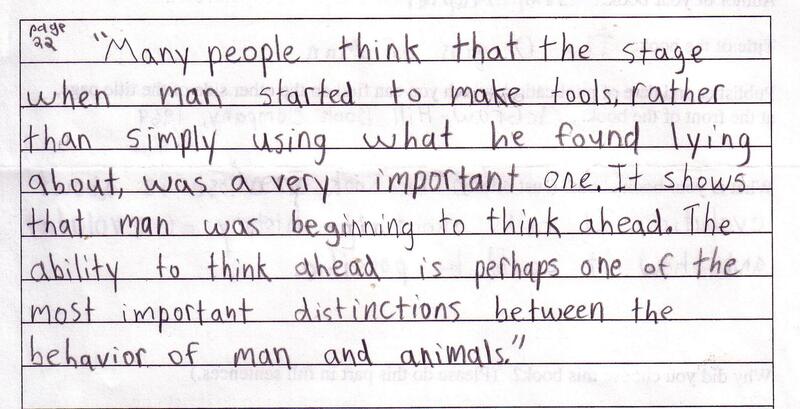 I’ve scanned both the copied passage and the student’s explanation for why she chose that book. Other students jumped right into paleoanthropology. The passage below came from The Origins of Man, by John Napier. Reading through these, child by child, I am so moved by what grabbed them, when they were just sampling our topics to create an overview for each other. All four of those kids, J, J, S, and J, were drawn to story interpreting evidence–historical evidence, evidence from biological research, evidence from paleoanthropology and archaeology–all of it warmed and made coherent by a little bit of storytelling. The first part of our exploration, about the evolution of species increasingly like us, focused on the first time clap, which I’ve already described. 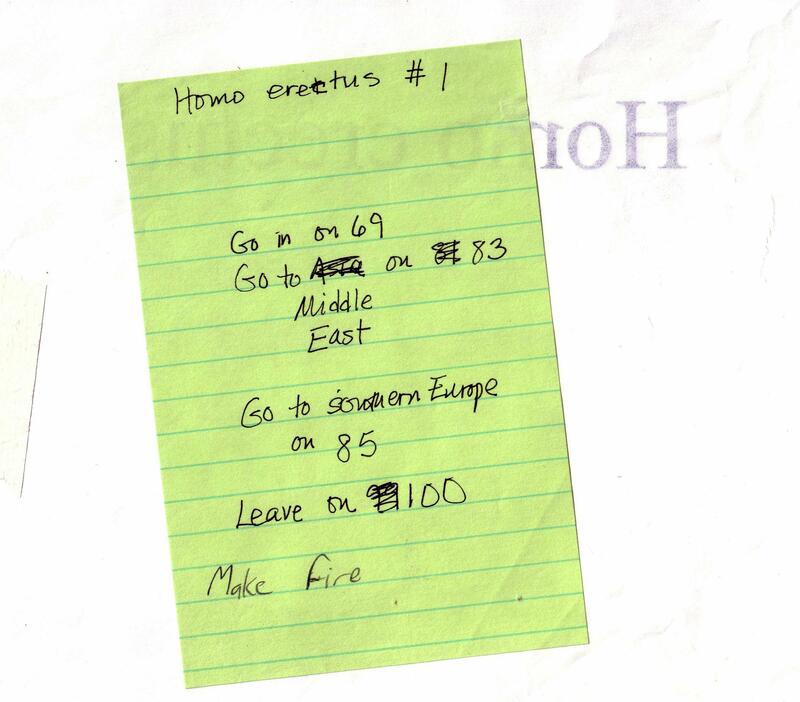 Here’s one student’s species sign, scanned to show the directions on the back. Like some of the other pieces I’ll include, these were quick pieces of writing done overnight for homework, in response to an open-ended invitation to write about something that stood out for each student. They had a word limit–probably no more than 60 words, judging from the ones that show a word count. 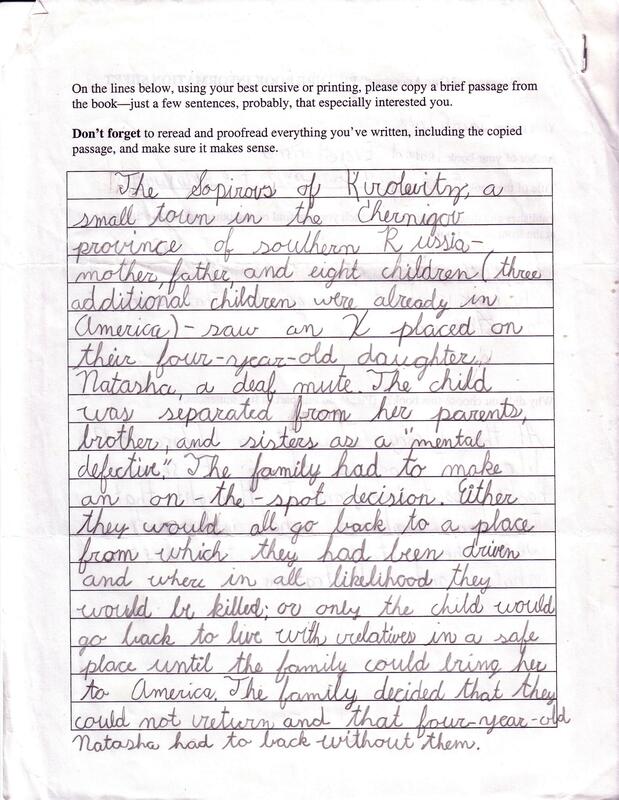 Sometimes pairs or small groups of students shared what they had written; sometimes volunteers read theirs out loud to the full class, as a preparation for watching the next chunk of video. Much of The Journey of Man is based on genetic evidence involving the Y chromosome. We did some other work to help us understand this, isolating DNA with help from parent volunteers, making models, reading other books. But all the kids were really taken with Spencer’s own treatment, using monkey oranges to lay out a big graphic on the ground near the San Bushmen camp. The crosses indicate a second mutation; so R’s diagram would have been even better if he’d shown that second mutation happening in an individual who had already inherited a first one. Overall, though, he showed real understanding, and like so many Touchstone students, he didn’t hesitate to critique and appreciate Spencer’s teaching technique! How did I handle informational errors in this kind of writing? Case by case. 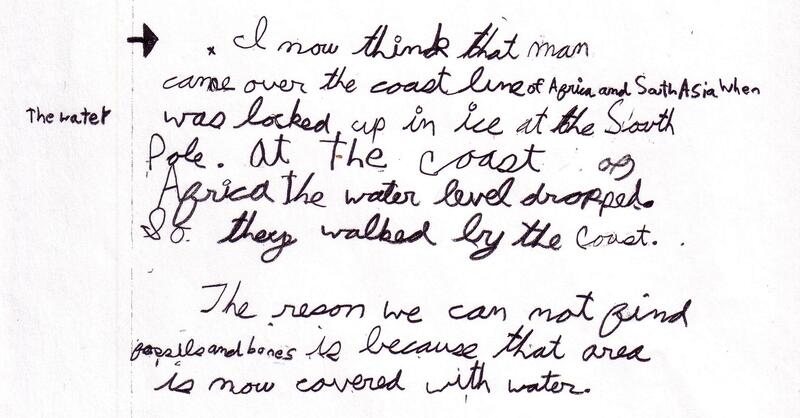 Sometimes I talked with the individual kid, or wrote a comment (which I’m cropping out here, mostly.) Often, I let signs of widespread confusion guide what steps the whole group would take next. I found one page I’d written when I was disappointed with an activity, brainstorming and evaluating ways we could approach the material differently. After all, I wasn’t doing this to grade students on their various levels of understanding; I was aiming for the greatest possible understanding by everyone–and all of us were being pioneers, including me. The learning spiraled; it was cumulative. We reviewed in a variety of ways, acted things out in a variety of ways, made obnoxious comments about guest scientists having bad hair days, and reached a point of intimacy with the material that was extraordinary, given its challenges. Later, we carried these ideas into the work we did in the spring, thinking about the history of human technology and the evidence of archaeology, in connection with The Second Voyage of the Mimi. Nothing I’ve ever learned about has fascinated me more than this big picture view of human history, and I couldn’t have had better learning companions. Writing about it, organizing my own artifacts, I’ve started rewatching videos, reading books and blogs. I’m excited by new evidence, and also by new attempts to convey the story as a story. I’ve also been struggling to understand online blogs and comments written by people who dismiss the Out of Africa evidence, for reasons that often seem transparently racist. How did we get from Africa to Australia as lickety-split as the genetic and archaeological evidence indicates–not just traveling but colonizing? Just what role did bamboo rafts play? Is there any way I could wrangle myself an opportunity to make a bamboo raft? And what about the evidence that even Homo erectus, much longer ago, used some kind of transport across water? But also: what can be done to heal the increasing polarization between people who are excited by scientific evidence–even when it’s confusing or contradictory–and people who are threatened by it? How will my past students navigate that crossfire? Ultimately, for me, this is the question: How can we build and share a new evidence-based story of our origins? Part of the answer, of course, as always: together. Jackie Lockney, amazing Touchstone physical education teacher, advocates something she calls “Challenge by Choice.” She helps students identify the skill–or the level of participation in a game, or the form of safe risk-taking–that they can move into when they’re ready, and she gives them whatever support they need–but they get to choose, kid by kid. Jackie can talk a kid through a climbing element high in a pine tree, in a way that has felt almost supernatural to me when I’ve observed it. Not many people with Jackie’s personal physical skills can enter the mind of a kid who freezes, physically, unconsoled by the safety harness and line, and unable to talk himself or herself through–the kid who can only take that kind of risk with a copilot. Out of her sight, without her even knowing, I’ve sometimes borrowed Jackie’s coaching-from-the-ground voice, to help myself get back on my bicycle, or tackle a mess. Of course, we don’t always get to choose our challenges. People close to me are facing hard things right now, things they chose only in the sense that they agreed to love each other. As teachers, we can’t always offer our students total flexibility or total choice in the timing of challenges. The deadline of an announced performance date always becomes a kind of emergency, no matter how carefully we plan the preparation. Teachers feel terrible, sometimes, putting kids on the spot by saying weeks ahead of time–the way we must–that a class will share some finished product on a given night. On the other hand, here’s my image of what can result from that leap of faith–a physical expression of this class’s pride and relief at being done with their individual presentations for the Alhambra Banquet. I wish I could share the sound clip of whooping joy. I took a risk this past month, agreeing to be one of several poets who are writing poems in response to sculptures, for a special online chapbook associated with the exhibit’s website. Here’s the big risk for me: less than two weeks for the writing and revising. What’s so risky? My usual process as a poet involves months, often years, of revision. To produce something on this schedule has been like writing in a completely different genre–as if I’d worked in fabric for decades and suddenly tried to work in clay. One side-effect: an unusually long gap between blog posts. Nobody is hollering, but I’m worried, for my own sake, that after too long a break I’ll forget how to get back on this horse, too. On the other hand, I’ve learned some things, launching myself out of my comfort zone this way. The process of revision that means so much to me, within which I invariably learn and grow, consists of a conversation among various versions of myself, with an odd commitment to democracy and equality among those selves. Facing this deadline, I’ve been figuring out short-cuts for staging that conversation among selves, without waiting for years to go by. For one thing, I’ve hollered for help, showing drafts of the poem much earlier than I usually would, to family members and to fellow Every Other Thursday poets. They’re not different versions of me, of course, but they trigger different versions, as I respond to their thoughts. I’ve also pushed hard on something I’ve always known: that I could bring a different mind to a piece of writing, maybe especially a poem, by taking it with me somewhere outside my house. I’ve experienced breakthroughs for these sculpture poems while listening to 50’s and 60’s rock in the vintage McDonald’s on the Massachusetts turnpike; also listening to spring peepers near the Milford bike path; also in a nearby greenhouse tea-shop; also while listening to the sleeping breath of my youngest grandson, staring out at the hemlocks behind his house. Obviously I’ve had to do some express writing (and express risk-taking) for this blog, too. 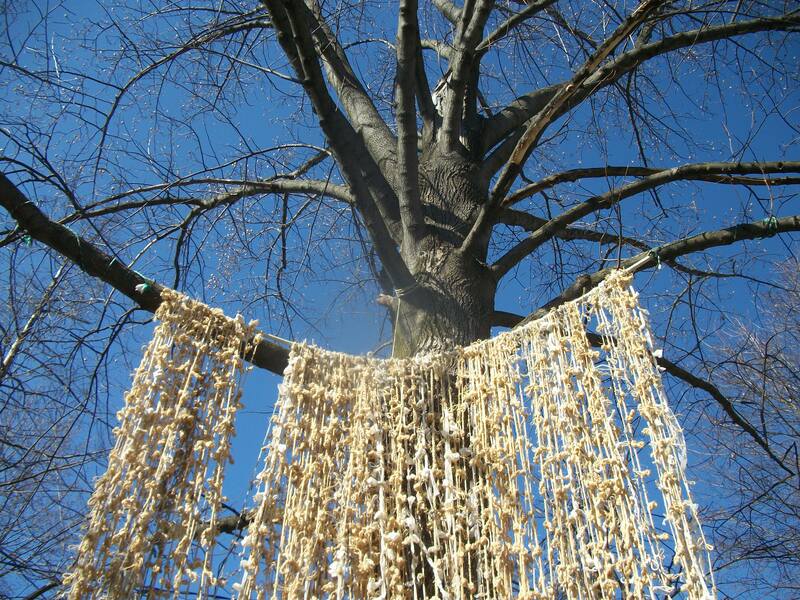 No, it’s not death-defying, but I know myself better than you do; I’m up a pretty high tree, on this also. What are these sculptures about which I’m writing? They’re sculptures by Boston area artists, in a show organized by the Energy Necklace Project at the Jackson Homestead in Newton, Massachusetts. They’re stunning. Here’s a detail from one of the pieces about which I’m writing, a fiber piece by Linda Hoffman and Margot Stage, called Forest Fall. If you follow this link, you can see the official photographs for the whole show. The artists I heard speaking, at the exhibit opening, intrigued me with their descriptions of process, and moved me with their stories. 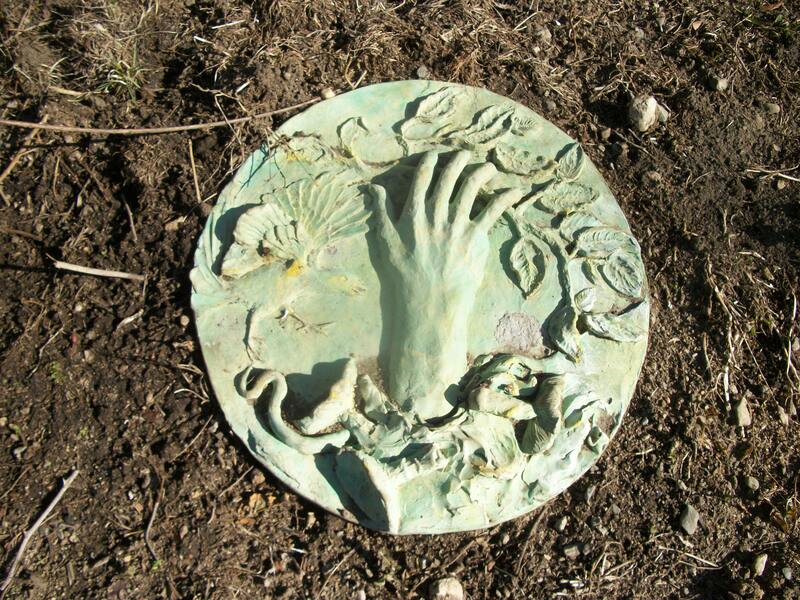 If we have good weather, the poets will walk from sculpture to sculpture, reading, on June 1st. And any hour now–really soon–I’ll decide that I’ve done the best I can to live up to the sculptors’ work and courage, and I’ll let go of the poems they inspired. I’m planning to have my surrogate Jackie Lockney voice at hand when I press send. The paragraphs go by much faster than the learning did. If you let each paragraph equal a day, or a week, or maybe even five years of our own process, alternately scrambling like mad and sitting back soaking it all in–then you might have just about the right scale. Kate Keller’s genius invention of the time claps was partly about time, but also about scale: using the small as a window on the huge. Of course, sometimes we make scale models in which something made large is used as a window on the small–much larger models of the DNA helix, for example. But here, we were definitely trying to grasp huge, and the time clap model was a way to compress very long periods of time into periods of time we could experience. The time claps were also about changing the scale. The 5,000,000 years of hominid evolution we considered for the first time clap (and the previous post) are a drop in the bucket compared to the history of life, or an infinitesimal speck compared to the history of our universe, which we only waved at. Hello, history of universe, we are breaking off a tiny chunk of you, which seems enormous to us. Five million years is one hundred times as long as the 50,000 years of our own species’ wanderings across the continents. When our class went from the first time clap to the second, we were thinking about one-hundredth as long a stretch of time all together, and each clap was worth one-hundredth as much time as before. Our species had been around for a while before some of us took the chance of leaving Africa, almost certainly unaware that we were switching continents, but meeting considerable challenges to expand our territory. Following Spencer Wells’s account, based on research with Y chromosome mutations, we tracked our way from continent to continent. 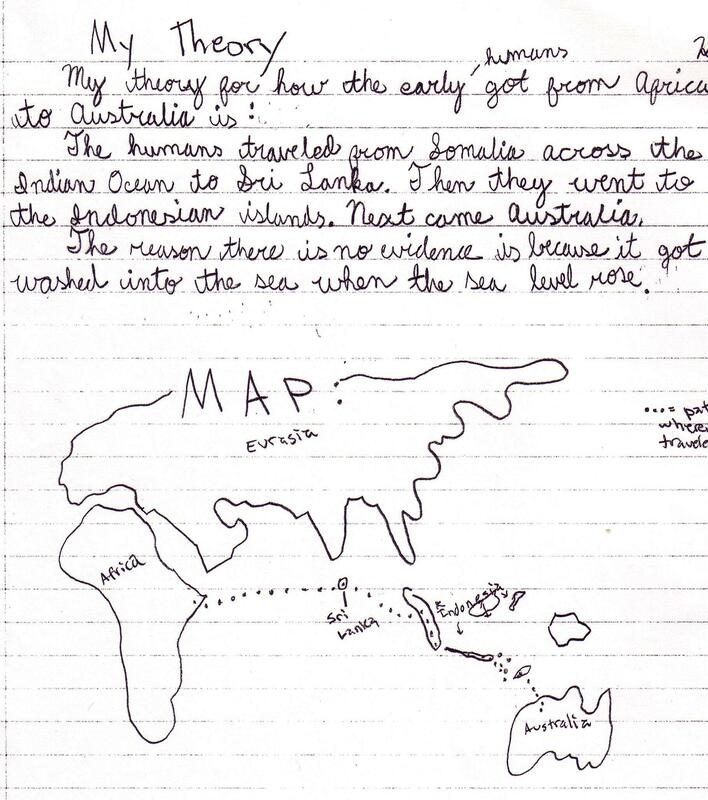 At each stage, through weeks of learning, we investigated some of the remaining indigenous peoples, again following Wells’s lead and using his video, The Journey of Man, in which he visits Aboriginal Australians, people from remote villages on the Indian subcontinent, central Asians, Chukchi people from eastern Siberia, and Navajo in North America. The time clap itself was a way to summarize what we’d learned: about genetics, about the challenges of human expansion into new environments, about ways the human body had evolved to handle those new places. 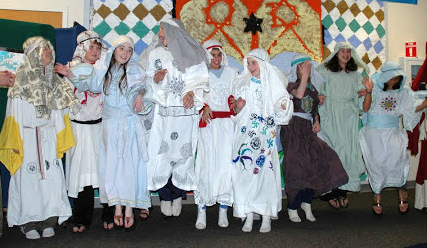 Clapping and counting together–clap, two, three, four–we let each four-second interval, each clap, be worth 500 years. 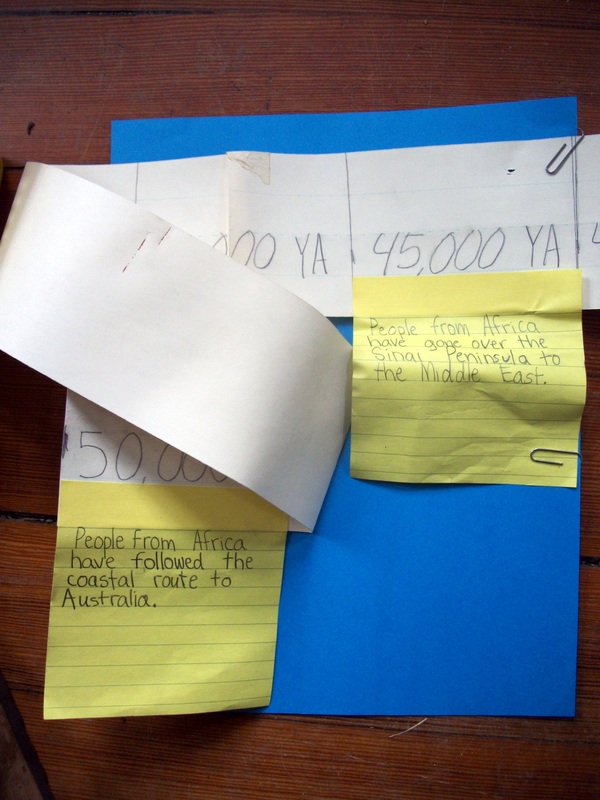 Each student, or a pair, was responsible for moving onto the map at the right time, and placing one of our crepe paper streamer lengths. He or she placed one end in the area where that y-chromosome mutation is thought to have arisen, then carried the streamer following a simplified, summarized version of that mutation’s spread. We worked hard to figure out all the logistical problems in showing these things. Here’s a detail from the photo I used in an earlier post, so you can see that Russell is poised to do his job as the time line person, responsible for showing at each clap where we were on the time line. 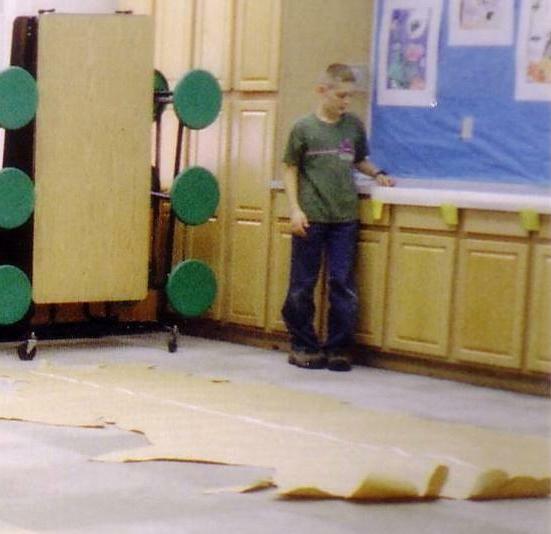 The pieces of brown paper on the floor are continents. I folded the first section of this time line, so I could show two labels almost in focus. Here’s a detail from a map in The Journey of Man. 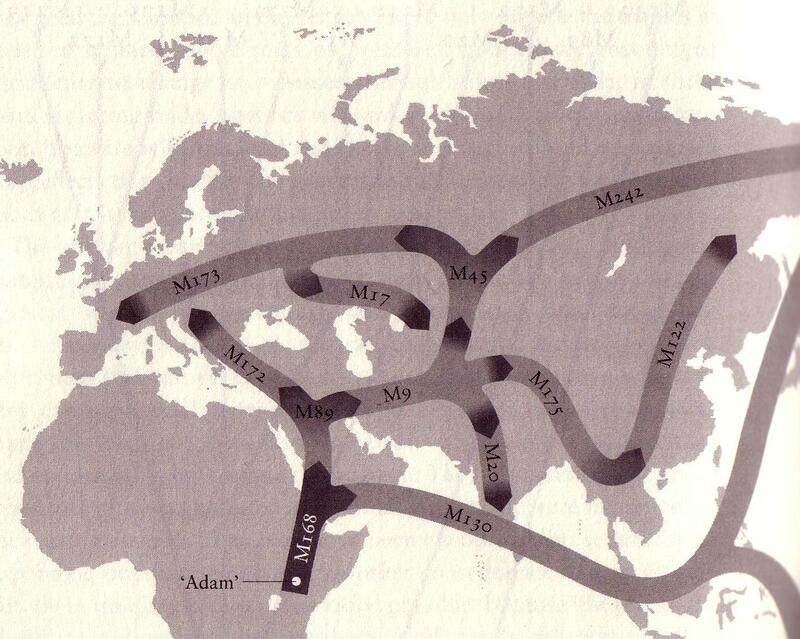 which we used as our way of timing the spread of groups of Homo sapiens across our own paper continents. 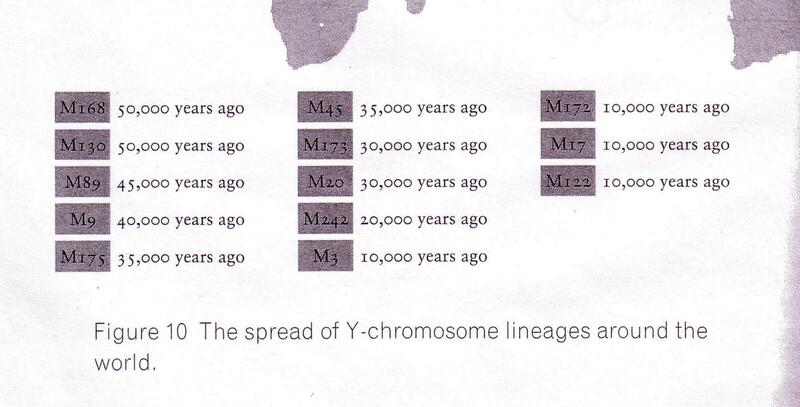 Each arrow is a schematic representation of the spread of the y-chromosome mutations that have let scientists reconstruct this sequence of expansions. One student carried one of the M130 streamers by the coastal route around the Indian subcontinent, and then through southeast Asia to Australia. There was much less water to cross, in the time this happened, because the sea level was so much lower, with lots of water locked up in ice. Much more of southeast Asia and the nearby islands stretched in one long continuous land mass. But still, there were many miles of open ocean to cross, to get to Australia. Somehow people did it, spreading around the perimeter of the Indian Ocean astonishingly quickly. Another student carried the second M130 streamer northeast to Siberia and then to North America–a very long expansion into harsh conditions, that took a much longer time. This whole field of human population genetics is moving fast. M130 is now designated as C-M130, and on Wikipedia you can find an excellent, very technical article about the C-M130 lineage, or haplogroup. I love the labels on these streamers, made by students, full of pride in their own technical knowledge at that point. 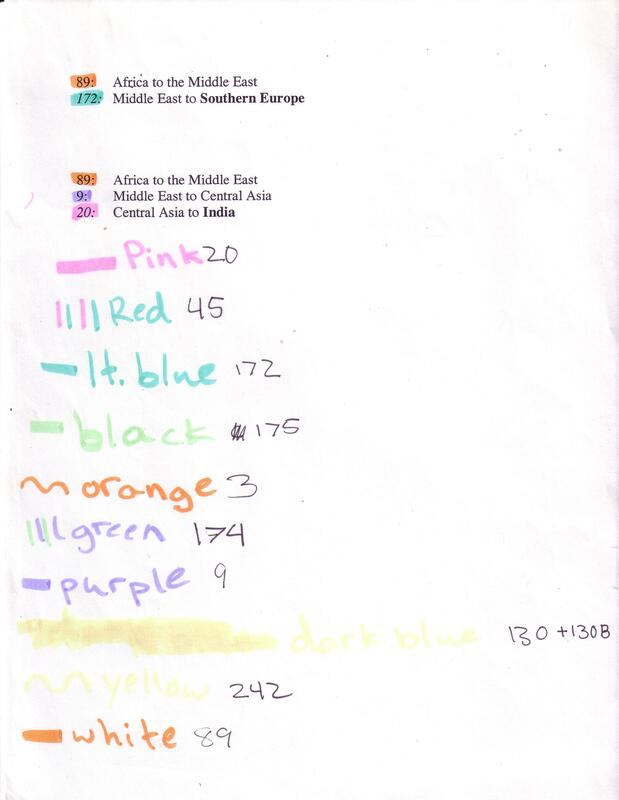 I’m not sure about this streamer with its many colors, mutation group leading to subgroup, leading to further subgroup, but I think it has the earliest journey on the outside: out of Africa leading to the Middle East, to south central Asia, to central Asia, to Siberia. If you want to start a fight at a meeting of the folks who pay attention to such things, just ask about how we arrived in the Americas. Increasing numbers of scientists now say that boats must have been involved, small boats made probably out of walrus or other large marine mammal skins stretched over frames, like the ones coastal Chukchi people still make and use. Spreading across the northern edge of the Pacific Ocean west to east, we probably kept fairly close to the coastline or ice pack, and in each new venture moved only far enough to come to an ice-free coastal area that had what we needed. Alice Roberts describes her own take on this in her video called The Incredible Human Journey. Because of lower sea levels at the time, that ancient coastline is far out to sea now. Boats wouldn’t last to be found, and coastal settlements would currently be under many feet of water–so there’s not much archaeological trail of any kind, so far. The evidence is all circumstantial: somehow we arrived in places that involved crossing wide stretches of water, no matter how low the sea level had dropped. However they did it, some very small percentage of my own ancestors made that ancient journey into North America. Still, that’s not why I say “we.” I’ve come to feel that all of this story belongs to all of us. The rest of the ancestors of our class (including most of mine, and Kate’s) came to North America more recently. 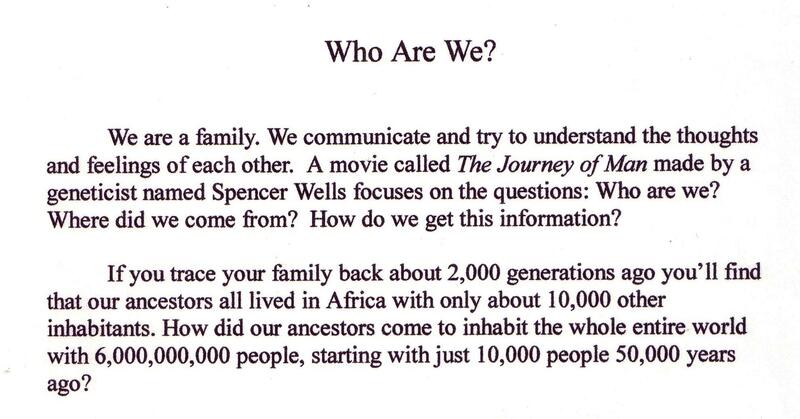 We wanted to end this thematic study of who we are and how we got here by learning about our recent immigrant ancestors, and the patterns of goodbye and hello that shaped their lives. So we changed the scale again. In our preparations for the third time clap, we looked at just the last 500 years of immigration to North America, and focused on stories we had gathered, about people related to us and about family friends. Those included Pilgrims who traveled on the Mayflower, representatives of the huge influx from eastern and southern Europe in the early 20th century, and more recent immigrants from Latin America, some with mixed African heritage. For this time clap we made a very simplified geographical representation that could fit in our classroom. Simpler props–but we were moved and focused by representing individual real people whose stories we knew. Clapping and counting, holding signs, we showed their individual arrivals decade by decade. What do Kate and I think about, looking back at all this? I often recall a memory that is uneasy. 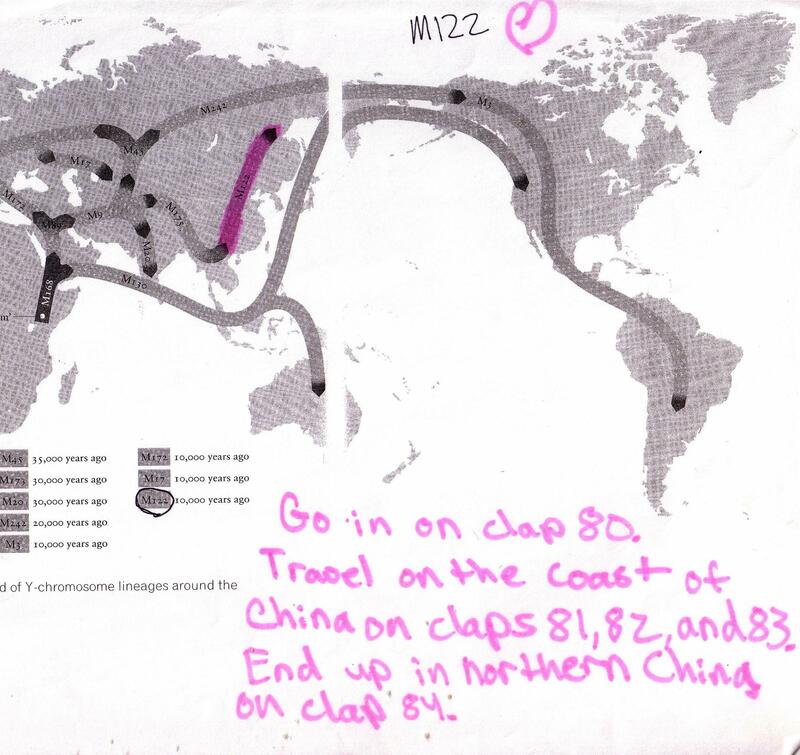 A girl who had been adopted from China represented herself in our third time clap, and “traveled” east to North America. She joined us from another class, and we were proud and excited to have her take part. Only afterwards, and with regret, I realized that she was embarrassed, unhappy to have been identified as a recent immigrant. Kate remembers worrying that we were all focused so intensely on our parts in each time clap’s execution, struggling to move and do the right things at the right moment, that it was hard to pay attention to the whole as it happened around us. At least for us, for Kate and me and the invaluable parent volunteers who helped us pull it off, each of those not-quite-seven-minute stretches went by in a blur. So we might be tempted, doing it again, to change the scale and make each time clap last longer, not in what it represents but in how long it takes in the present. Of course, then we might lose people in the long stretches with not much happening. Trade-offs. Probably we’d let the kids decide. For sure, the value was not so much in the observed performance, but in the experience from the inside–all the preparation, and that immediate sense of taking part in something huge. Lucky-and-a-half, both grown-ups and students, we felt like explorers ourselves, opening up new knowledge, sharing that with our families and with each other, imagining eyes focused on new horizons.